While the long-term economic fundamentals of the LNG business remain positive, some producers may just pull the plug on future projects, if prices continue to be depressed. Audrey Raj reports. PETRONAS CEO Wan Zulkiflee Wan Ariffin. Image from PETRONAS Instagram. Lower oil prices and their critical impact on the world’s massive liquefied natural gas (LNG) industry loomed large as a hot topic at the LNG 18 conference and exhibition held in Perth, Australia. 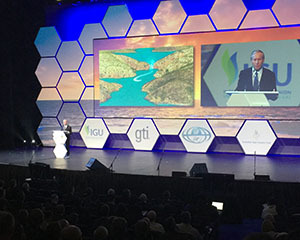 Industry experts gathered at the four-day event to call for a more equitable relationship between consumers, producers, contractors and governments to ensure the continuity and sustainability of the LNG business. Speaking to delegates, Ahmad Adly Alias, PETRONAS’ vice president of LNG marketing said that consumers and producers have a responsibility towards sustaining a fair balance in the market that would mitigate the impact of cyclical LNG price movements on all stakeholders. “Currently, there is a perception that the LNG market will be oversupplied for a long time, prompting many buyers to demand better commercial terms from sellers,” he said. Alias added that the anticipated project deferments due to the unfavorable price situation would only lead to future tightness in the market that will be unfavorable to all stakeholders. And while buyers are taking advantage of the current depressed market to save cost, in the long run they must allow prices to return to a more reasonable level to support producers in bringing supplies on stream. This is where all key stakeholders must play their part to create a more equitable LNG market, capable of supporting future investments in the pursuit to ensure uninterrupted and affordable energy supplies to fuel the world, said Datuk Wan Zulkiflee Wan Ariffin, president and group CEO of PETRONAS. 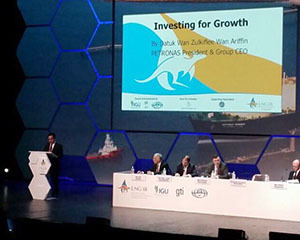 “We’re not only investing in the upstream development projects, plants and LNG vessels but also in developing the capability of the people operating them, talents throughout the whole value chain, from geologists to plant technicians, right up to the mariners, LNG marketers and traders,” he said. Governments, Wan Zulkiflee added, should introduce firm policies to support LNG use as an alternative to other fossil fuels and support investment in new infrastructure and resources, as it will help mitigate the social cost linked to emissions, such as chronic pollution and high-cost public healthcare. RasGas CEO Hamad Mubarak Al-Muhannadi said the sector must also continue to be underpinned by long-term focus, rather than be unduly influenced by the current increase in spot pricing trading levels and shorter supply contracts. 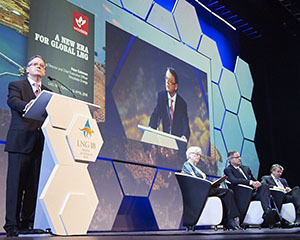 “There is no more testament to the potential growth of LNG worldwide than the fact that today there are 30 countries importing LNG, twice the number of just 10 years ago,” he said. “The LNG landscape has evolved considerably over the past decade and promises further changes in the years to come. We anticipate that the pace of growth will continue and more countries will be importing LNG in the next decade. “Through these cycles though, which are part of the global market for LNG continuing to evolve, it is still a business requiring significant capital investments in production, liquefaction and transportation,” he said. The most important areas to focus on are design, engineering and construction. LNG plants have become more expensive because more time is taken to engineer them, due to lower productivity and complex locations. He said that Shell is playing its part in these areas, and a case in point is the firm’s floating LNG (FLNG) project, Prelude, designed to open up remote gas fields considered too costly or difficult to develop in the past. Well into its construction phase, Prelude is now a standardized design. Depending on the composition and location of gas reservoirs, Shell can add different pre-designed topside modules and offloading systems. And working with strategic suppliers, the project also led to spinoffs. Woodside Energy CEO Peter Coleman. Image from Woodside Twitter. Like Shell, Woodside Energy is also planning to drive down costs over the next two to three years with step-changing technological advances. CEO Peter Coleman said their company is aiming to position itself for FID so that it can provide LNG supply in the early to mid-2020s when the market will be demanding it. Technology remains a key investment area for PETRONAS as well. In March this year, the group unveiled its FLNG facility, PFLNG Satu. Although, pioneering this technology was a considerable investment for the firm, it paves innovative ways to extract stranded molecules and monetize them. In terms of size, complexity and durability requirements, the INPEX-led Ichthys LNG development stacks up as the most challenging project yet built in Australia. It includes three mega projects in one. Louis Bon, managing director of Ichthys LNG said while the project has some way to go, the group is increasing industry knowledge, pioneering some technology and learning lessons in managing challenges never seen before. “We are 81% complete and on target for first production in the Q3 2017,” he said. “Australia has a target of supplying around 84 million tonne of LNG in 2018. Ichthys will be providing more than 10% of this capacity. “The Ichthys joint venture participants also have the opportunity to add four more production trains fed by Browse basin and Bonaparte basin gas, which is now far more accessible because of the Ichthys gas export pipeline,” he told delegates. According to the International Gas Union’s 2016 World LNG report, LNG trade reached 244.8 MT in 2015, up 4.7 MT from 2014, surpassing the previous high of 241.5 MT set in 2011. Although the Pacific basin remains the largest source of demand, growth was driven by Europe and the Middle East. The report showed that in 2015, global liquefaction capacity reached 301.5 MTPA, and the start-up of new projects in Australia and Indonesia contributed to the growth in non long-term trade. In total, all non long-term LNG trade reached 71.9 MT in 2015, accounting for 29% of total gross LNG trade. 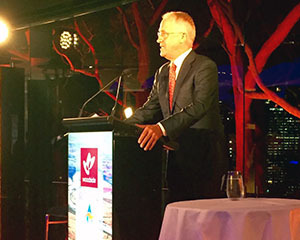 Western Australia State Development Minister Bill Marmion said although Indonesia and Western Australia are both significant exporters of LNG, there are great benefits in working together. He said Western Australia’s capacity for innovation and dependable service were increasingly valuable assets across the region. “There are more than 800 global and local energy companies and related equipment, technology and service providers based in Perth, many of which could provide expertise and technical know-how to help improve the efficiency of Indonesia's gas sector to meet increasing domestic demand,” he suggested. Addressing collaboration between Australia and the US,John Berry, Ambassador of the US to Australia noted that American companies are making an investment of over US$100 billion in Australia’s LNG sector, creating thousands of jobs helped to spur innovation and growth. “Game-changing developments are taking place right now,” he said. “Australians and Americans have pioneered innovative technology required to keep costs low, improve efficiency, and minimize environmental impact. “And across Australia, US companies are breaking new grounds. ConocoPhillips developed new flare technology for its Curtis Island LNG facility and supports a carbon offset program in West Arnhem Land. “Here in Western Australia, Chevron is eliminating up to four million ton of greenhouse gas emissions at Gorgon by utilizing state-of-the art carbon capture and sequestration technology. Instead of being released in to the atmosphere, carbon emissions are captured and trapped in an underground reservoir,” he said. Premier of Western Australia Colin Barnett. Image from AOG staff. In Western Australia, the LNG industry enjoys strong public support, and this is not the case for the coal seam gas projects on the east coast, highlighted the Premier of Western Australia, Colin Barnett. Barnett said perhaps the environmental protest there would be more tempered if these projects also supplied gas to the local economy rather than being fully exported. “In fact, public opposition has been exacerbated by the projects having to purchase additional gas to meet export contracts, thereby causing local supply shortages and higher domestic prices. The industry needs supporters not opponents,” he said. Australia as a nation, however, is rich in energy resources. This includes coal on the east coast, gas on the west coast, uranium in the interior and a wide potential for renewable energy. Black coal deposits are found in the east coast states of Queensland and New South Wales. The state of Victoria also on the eastern seaboard has large reserves of a lower quality brown coal. Barnett said while Australia’s gas reserves are not large in comparison to world reserves, making up only 2% of the total, they are, however, relatively undeveloped and strategically located in the Asia-Pacific region. “Australia’s total conventional gas resources are estimated at around 150 Tcf, with over 90% of those resources to be found off the Western Australian and Northern Territory coast. The Carnarvon, Browse and Bonaparte basins have proven resources of 133 Tcf,” he said. Barnett added that there is more to the global LNG market than the simple economics of supply and demand. Like all energy markets there is a complex overlay of politics and environment. For example, the recent signing of the Paris Climate Change Agreement by over 100 countries signals an international alliance to reduce the usage of coal in power generation. Similarly, the lasting effects of the Fukushima disaster means that the nuclear alternative is not growing as fast as was previously thought. Australian Prime Minister Malcolm Turnbull. Image from LNG 18 Twitter. The Prime Minsters of Australia, Malcolm Turnbull said his government wouldcontinue to make Australia an attractive environment for investment. “To fulfill our side of the deal, we must do more than simply welcome foreign investment,” he noted. “That’s why we are reducing regulation; speeding up the process of environmental approvals; making the workforce more efficient; and reducing production costs through skills and migration initiatives. “We will continue to ensure that our taxation system encourages investment, entrepreneurship and job creation. And at the same time we will continue to ensure that every business - large or small - pays their fair share of tax in accordance with the law,” he said.